Negativland's new album, It's All in Your Head, finds the group tackling their biggest subject ever: why humans believe in God. 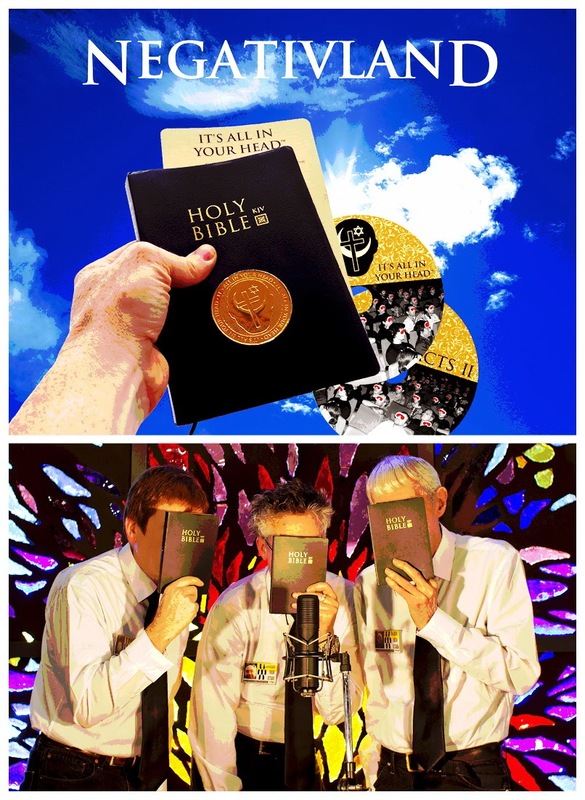 Millennia-in-development, this ambitious and densely-crafted double cd is packaged inside an actual Holy Bible which has been appropriately re-purposed into a "found" art object, handmade by Negativland. It's All in Your Head intends to entertain, inform, and provoke. On the cds, Negativland mixes found music, found sound, found dialogue, guest personalities and original electronic noises into a compelling and thoughtful musical essay that looks at monotheism, Christianity, Islam, Judaism, neuroscience, suicide bombers, 9/11, colas, war, shaved chimps, and the all-important role played by the human brain in our beliefs. Reading the attached Bible is optional. The audio is presented as a live radio broadcast, modeled after Negativland's weekly Over the Edge radio program on KPFA FM in Berkeley, CA. This theater-of-the-mind project has been assembled from basic tracks recorded live in front of blindfolded studio audiences, and documents the unique style of live collage performances that Negativland has been presenting on stages, and on radio, since the formation of the group in 1980. It's All in Your Head is 100% new and different from the long-unavailable limited edition Over the Edge Live on Stage cd, made from multi-track recordings of entirely different performances and crafted in the studio over a period of several years.